When I was a teenager my grandmother started experiencing some arthritic joint pain. Even though she was in her late 70s this woman was in prime health as she took dance classes all year long, swam three times a week, walked approximately 20 miles each week, and even went tubing with us in the summer. She didn't want to be slowed down and so she started seeing an acupuncturist for her arthritic joint pain. She found great relief and so when I first started to suffer from Endometriosis I (being extremely skeptical) started to see her acupuncturist. I was amazed at how much this helped my pain and as the years continued I would see an acupuncturist off and on for various things. (1) Acupuncture relieves stress. 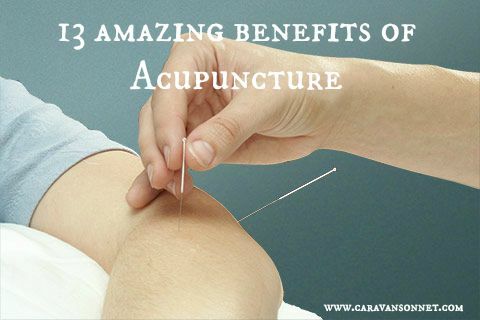 A well-known and beneficial side effect of acupuncture is that it relieves stress. Not just "stress" as we think about life, but stress that is within in the body, helping the chi flow. (2) Acupuncture helps with nausea and vomiting. For those who are under a very strict medical treatment acupuncture can help with the side effects of chemotherapy and other medical treatment that causes extreme nausea and vomiting. (3) Acupuncture helps with headaches and migraines. Dr. Kalus Linde who is a complementary-medicine researcher at Technical University Munich in Germany states that having consistent acupuncture treatments can help reduce the amount of headaches and migraines that people get each month. In a recent study he did he found that half of the patients in the study reported a 50% decrease of headaches each month. (4) Acupuncture helps reduce allergy symptoms. For those that suffer from seasonal allergies acupuncture can help decrease these symptoms. (5) Acupuncture can help with depression symptoms. Getting regular acupuncture treatments can help treat depression symptoms as acupuncture can help equalize neurotransmitters in the brain. Specifically Dr. Cheng explains that when needles enter your earlobes, hands, or feet your brain releases neurotransmitters and other chemicals that affect stress and mood helping to ease depression symptoms. (6) Acupuncture can help boost the immune system. Having regular acupuncture treatments can help boost your immune system by activating the cells in your body that help beat disease and infection. (7) Acupuncture can help increase energy. (8)Acupuncture can help stop insomnia. (9) Acupuncture can help with gastrointestinal problems. Dr. Tony Chon from Mayo Clinic states that acupuncture has been used for centuries to help with relief and treatment of gastrointestinal problems. In a 2007 University of Arizona study people who had chronic heartburn and were not responding to over the counter antacids underwent acupuncture twice a week for several months. Every participant reported at least an 82% reduction in pain and in their symptoms! (10) Acupuncture can help decrease menstrual cramps and PMS. (11) Acupuncture can help decrease pain and muscle aches. A recent study that was completed at the University of Michigan shared that researchers found that acupuncture seems to help pain receptors in the brain bind more easily to opioids such as endorphins, which is the body's natural painkiller. (12) Acupuncture can help with weight loss. (13) Acupuncture can help ease anxiety. A recent study that was published in the Journal of Alternative and Complimentary Medicine found that patients who were suffering from severe anxiety and panic attacks can benefit greatly from acupuncture. If you want to give acupuncture a try I recommend looking for a licensed or medical acupuncturist. If you search for these types of acupuncturists many times they certification from the National Certification Commission for Acupuncture and Oriental Medicine. You can find search the database (www.nccaom.org) to find acupuncturists who have graduated from an accredited school and passed their exam. I stress this simply because there are the horror stories of acupuncture and you want to find an amazing and qualified one! Believe me I adore my acupuncturist and you will too!! Let me know if y'all have any questions! I would be happy to answer them! Happy Thursday friends! This definitely makes me want to try it for my chronic illness. Nina! I definitely would recommend it if you feel it might help you. I don't know your exact story but I do know that I have found some relief from this type of alternative therapy. I hope that you are having a wonderful week so far!! Many studies have found that TCM Mississauga treatment can reduce the number of Reynaud's phenomenon; helps improve conditions such as irritable bowel syndrome; along with enhance other medical treatments for gout, if used with combined therapy. Thank you so much for sharing!! :) It is wonderful how many different ways that acupuncture can help people!! Thank you so much for taking the time to share today! We looooved doing acupuncture, and while we don't do it anymore are definitely fans! SO many great health benefits! Yea!! So glad that you loved it too!! :) There are so many health benefits- way more than what I have listed here! :) Happy Friday friend!